Relyence FMEA’s unique always-in-syncTM feature keeps your analysis always in control. With Relyence FMEA software’s unique always-in-sync™ technology, you can rest assured that your FMEAs remain organized and complete. Relyence FMEA maintains data connections between all phases of your analysis – from your Design FMEA (DFMEA), to your Process Flow Diagram (PFD), to your Process FMEA (PFMEA) Worksheet, to your Process Control Plan (PCP or CP). All parts of our PFMEA software, from the PFMEA Process Flow Diagram, through to the PFMEA Control Plan, are integrated for ease of use and efficiency. 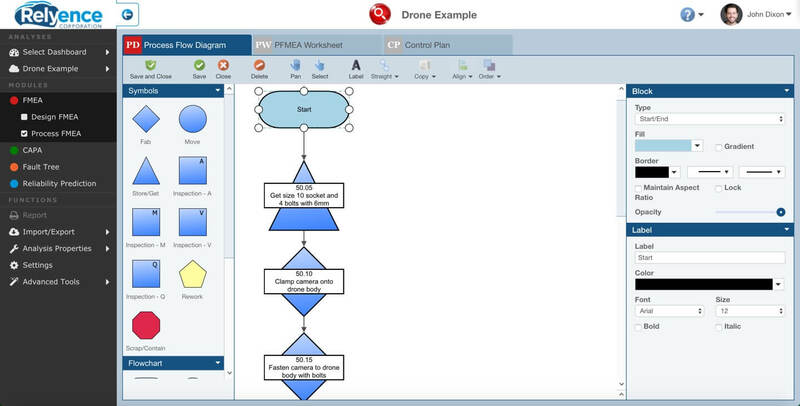 Our PFMEA package supports all aspects of your PFMEA needs: PFMEA Process Flow Diagram software, PFMEA software, and PFMEA Control Plan software. Guiding you along in your analysis, Relyence FMEA ensures that all elements of your failure analysis are accounted for. Relyence FMEA's always-in-sync feature keeps your PFDs, PFMEAs, and PCPs consistent and organized. Process Steps entered in your Process Flow Diagram (PFD) automatically appear in your FMEA Worksheets and Control Plans. Product or Process Characteristics are automatically propagated throughout your analyses. Prevention and Detection Controls are maintained across your FMEAs and associated Control Plans. 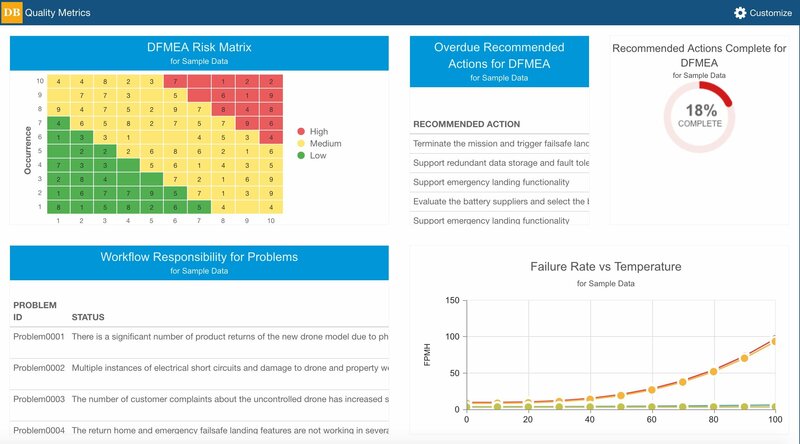 Product and Process Characteristics from your PFD are automatically tracked to Failure Modes and Causes. 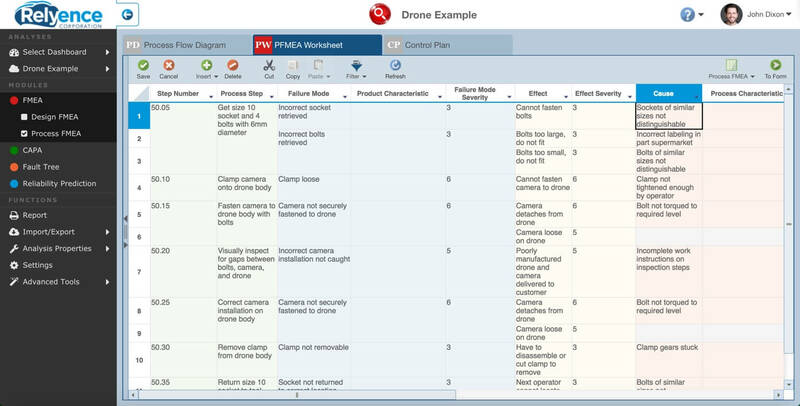 The PFMEA Worksheet is the core of your process analysis. 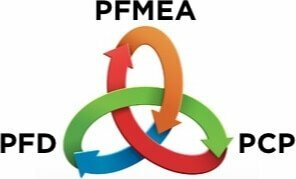 Relyence FMEA offers a standard PFMEA Worksheet with the most commonly used data elements for performing PFMEAs. You can use this template as-is, or modify it as required for your specific needs. Or, you can create a completely custom PFMEA Worksheet if you prefer. 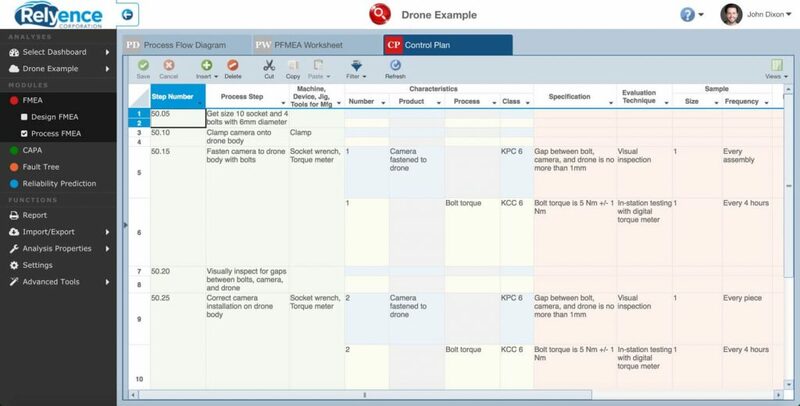 Your PFMEA Worksheet is automatically kept in sync with your Process Flow Diagrams and Control Plans. Relyence FMEA software provides the most efficient and effective process for performing your failure mode and effects analyses. There are many disadvantages to using FMEA Excel templates as tools in quality control and continuous improvement programs. Many of the drawbacks have to do with the uncontrolled and disconnected nature of the multiple documents created in Excel files. Not only is it often impossible to know with certainty where the latest versions of multiple documents are located, but crucial data can even become inaccessible when different teams and departments have ownership over it. In contrast, Relyence PFMEA software is designed with synchronization across multiple documents and seamless collaboration between various departments in mind. These factors are the cornerstones of creating FMEAs that are dependable, timely, and highly prized in quality control and continuous improvement strategies. In addition, since many organizations need to complete FMEAs as part of contractual requirements, the fact that Relyence PFMEA software meets several of the most common industry standards — including SAE J1729, ARP5580, MIL-STD-1629, and Six Sigma — makes it far more compliant than uncontrolled Excel templates.